SMART Repair vans pulling up onto your forecourt and spraying bumper scuffs with over spray covering your stock should be a thing of the past. Autoclenz has the solution, the Smartshop. 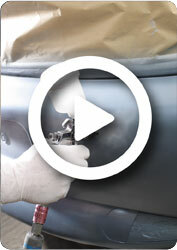 The Smartshop offers a complete cosmetic repair solution on-site. Covers all repairs such as bumper scuffs, paintwork scratches & alloy wheel kerb damage. The Smartshop offers a complete cosmetic repair solution on-site. By installing an innovative weatherproof booth, all repairs such as bumper scuffs, paintwork scratches, alloy wheel kerb damage, can be done in the same day by highly skilled and trained technicians, using fully compliant products and equipment. All you have to do is provide a flat area for it to be installed, a power supply and give Autoclenz all of your work at pre agreed rates. Autoclenz will invest in the facility and do the rest. Configure singularly or add combination of Prep bays, Paint bays and Finishing bays as required. All available in modular formats dependent on requirements and space available. We use only state-of-the-art materials, tools and techniques to perform full face refurbishment of painted and alloy wheels; that’s how we achieve a consistent, reliable and hard-wearing finish that makes tired-looking wheels new again and enhances the vehicle’s appearance. Wing mirrors are often subjected to impacts and scuffs, so using a 3-stage process of flatting, filling and repainting, we’ll repair the exposed back area of wing mirror casings whether they have a coloured or textured finish. This is a quick and affordable repair for customers, but a good opportunity to perform additional paid work on many of the vehicles that pass through your premises. Autoclenz Smartshop allows for easy upsells and enhanced customer experience, giving your dealership a unique opportunity to maximize profits. The Smartshop is permanently on site and can handle all internal work at favourable rates and turnaround times, but more importantly you can sell these repairs over the Aftersales desk with a typical retail margin of 35%.